Audio problem: After Casey and Frank have landed in the lake, via the bathtub rocket, Casey starts talking to Frank about having already prepared the escape. Her lips are never shown moving along with the speech. Continuity mistake: When Frank and Casey are escaping in the bathtub, the wall behind and floor below open up (the tub is suspended on a framework). When the shot cuts to a different view, the wall and floor are instantly back in their original closed positions as the tub blasts off through an opening in the roof. Factual error: In the early scene when they enter the "It's a small world" ride at the '64 World's fair, the monorail in the background runs way too fast. The actual one moved very slowly. Also the monorail would not have been visible from the Pepsi Pavilion. Continuity mistake: At the end when Frank crashes into the water, he climbs out, but only his hair is wet when he sits by the tree. 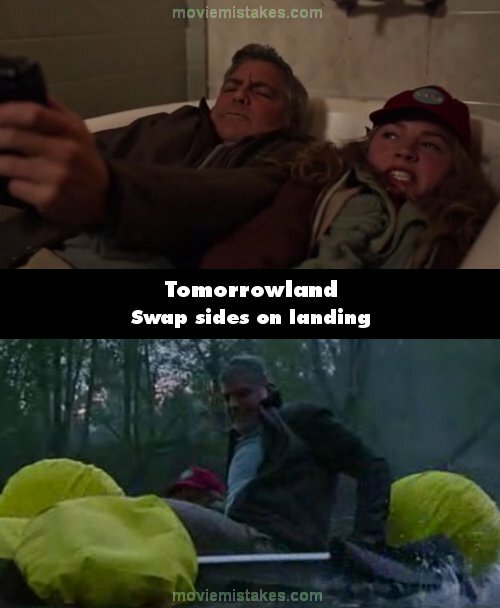 Continuity mistake: When George Clooney and the girls get in the capsule, he takes gauze, cotton balls, or something else white and puts it on her eyes before tying a black cloth around her head. When Clooney and both girls are traveling in the capsule, the white "stuff" changes positions every single time the camera turns on her. Continuity mistake: When Casey is collecting her stuff at the police station, she signs a document on the parcel that contained her stuff and moves it to the side. After this, the parcel changes position between shots.